Wow! Well done Kirk! This looks terrific. I'm curious to know why you stuck with the wire grip, wouldn't leather wrapped be more accurate? Thats what being a gentleman is all about! I personally cannot comment as to why Mr. Spencer choose to use the wire wrap, but it does have historical basis. There are several wire bound grips from the Viking period. Other grips and coverings seem to be more common, but a configuration such as this is not wrong. I think the artificial pattern welding looks perfect. It is a bit unnerving; I could see this being exploited by con artists. Nonetheless I think it is a very clever idea, and definitely improved the sword. Oh. Thanks, I didn't know that Vikings used wire wrap grips. It looks great! Kirk - Thanks! I had read etching can be pretty fragile, but your cut & cleanup is some opposite evidence. You painted etchant on gladius, a side at a time. Appears you gave this viking a bath - twice? If so how did you protect the (finished) reverse side during the 2nd bath? Its your hobby, the results are beautiful, & you are not trying to fool anyone. Plus, considered original smith's work. Very well done. I've been thinking about how something like this could be done. Hot mustard indeed! Wire wraps from viking times are indeed pretty common on finds, usually silver or gold single thread non-twisted thread, but some have dual or multiple wires twisted together. Single thread wrap can be seen in quite a few finds, a few good examples are Icelandic finds from Kaldárhöfða and Hafurbjarnarstöðum, as well as the swedish "Dybeck" sword. Some Norwegian finds have twisted multiple thread wrap, and this one had an original from Norway so it's plausible it had such a wrap. The type of wide flat pattern Spencer removed was too modern though and a good call. Overall he's done a fine and brave job of making an already impressive sword even more authentic. I too feel that if it's possible by such simple means to reproduce a pattern weld look one might question the authenticity of some swords being sold as such today. Especially those with lower pricetags. But then perhaps some swords back then were also faked this way, they may be as authentic in their own way as anything else. And it's always much better that we know about it, that it can be done and how. Today quality monosteel that's differentially heat treated properly are often stronger than pattern welded swords, so for safety in demonstration cutters this optoion may even be preferable. Perhaps this method is something for companies like Albion to look into, I mean selling it not as true pattern weld but stated as simulated pattern weld, as an option for their Anglo Saxon and Viking sword models. I knew I was taking a chance on such a fine sword, but I had Vlad Cervenka make it for me this this in mind... However, this technique could be used on any steel blade. It is great to hear from you. I have been wanting to thank you for your part in the VIKVERIR website. That is one fantastic resource! Those close shots of the ornamentation details are mesmerizing... something I have been waiting to see for a long time. Also thanks for the link to the over-sized image of the whole Arhus Farm find. If I had this image when I started this process, I probably would have tried to do a more exacting recreation of the blade pattern. It really shows the details of the pattern, far better than anything I have ever seen. I'm glad you can appreciate the imperfect-worn look. I like the bright and pristine look on swords also , but, to me, they just don't seem to have much "life" to them. With the imperfections and the wear, the object just seems to be connected visually to events. For instance where the wires on the grip have been worn through, most might see this as a flaw. To me, it recalls the warriors hand that used the sword. I guess it is only an aesthetic thing at this point, but I like it. Hadrian and Johan are exactly right. 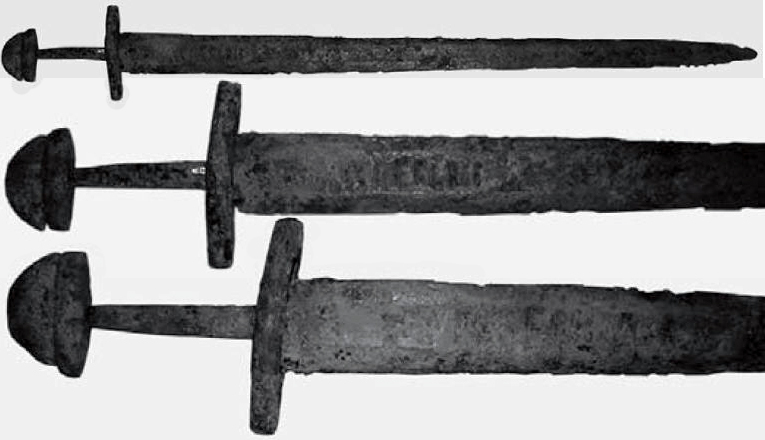 Wire wrap grips have been found on Viking swords. This is especially true of the Baltic area. Most of the time the wires are untwisted, but twisted wires have been found. Here is a link to a thread on Viking Grips which shows a couple of the better ones. If I can find time, I'll try to update this thread with more. I often get such a reaction when I artificially age swords... There are certainly persons of ill repute who can try to deceive with artificially ages blades... especially with the rise of Ebay. I would hope that before anyone spent tens of thousands of dollars on an orginal pattern welded blade they would have it x-rayed. I think there are portable X-ray machines now. It is interesting to me to see swords for sale as original finds which are finer than anything in the museums. In almost every case, there is one or more aspects of the sword which I have never seen on any sword from that particular era. This usually involves minimal but fancy engraving on the blade. Once you get topography (raised and lower areas) from the etch on a hardened, modern, mono steel blade, it is not fragile. I should know, I've sanded it off several times. It takes quite a bit of sanding to get it all smooth again. It does look like I am painting, however, on the gladius, I am not painting the etchant on the blade. A painted layer would not have enough etchant to cut. I am using an eye-dropper and creating a long pool of etchant. The surface tension will allow it to pool, held in place by the edges of the Scotch Tape. You have to be careful and not bump it too hard or it will spill over the tape and you will need to add more. Then... it can get really messy. This is one more reason the duct tape reservoir method works better. Beyond, more etchant, whole fuller etched at the same time, less obvious "weld" line, deeper cut, beyond this it is much less messy). Also with the duct tape reservoir you can rock it back and forth a little to help the etchant move which I believe gives a better cut. As for the other side to the blade... again the duct tape reservoir is great in that a layer of duct tape can be applied to the other side of the blade. When I was doing the Scotch Tape method, I coated the other side with Scotch Tape to keep any etchant that spilled from getting on the other side of the blade. This was a big mistake. It was extremely difficult to get it all off. Hope this helps... and thanks for the interest. If there are any other questions, just let me know. ...I too feel that if it's possible by such simple means to reproduce a pattern weld look one might question the authenticity of some swords being sold as such today. Especially those with lower pricetags. But then perhaps some swords back then were also faked this way, they may be as authentic in their own way as anything else. And it's always much better that we know about it, that it can be done and how. Today quality monosteel that's differentially heat treated properly are often stronger than pattern welded swords, so for safety in demonstration cutters this optoion may even be preferable. yeah.. Hot mustard. For some reason I kept wanted to eat hot dogs with this technique. Just needed some pickle relish. Ah.... Pickle Relish.... I wonder what that would do to a high carbon steel blade. I know what you mean about ancient fakes. I have often wondered if some of the decoration you see was not an attempt at mimicking pattern welding. [I have often thought it strange that of all the pattern welded blades I have seen none of them have had reverse twists stacked evenly... The reason I mention this is that, if done right, it would produce this pattern on the blade. XOXOXOXOXO. And then there is that Type X blade found in the Nene River near Raven's Willow England which has VLFBERHT inlayed on one side and INGELRII on the other. This "faker" was certainly hedging his bets. Jeff Pringle thinks it looks great... What a compliment! I am certain you could have done it for real faster than my fakery... but if I had tried to hammer it out myself, I would still be hammering away (or more likely be in the hospital with third degree burns.) Though I do go out in my garage sometimes and heat some steel with my propane torch and hammer on it. Especially in fall, when the air is cool and the iron is hot and the ring of the hammer... just something primordial about it all. I do have great respect for your work and knowledge on the matter. As a matter of fact, the idea of the reverse twist (X and O) posted above comes from seeing a blade where you did this... I think it was on the BladeSmith's Forum Board. Thanks for the link to that thread about wire wrapped viking grips. I don't know how I missed that one. The sword looks great, I'm sure you'll enjoy it! I sure enjoyed seeing it. that is an amazing job . there is only one bit of it all where you have a scroll in the back edge bar that does not look real . you have it nailed . I must ask how long it all took , as it looks like an awfull lot of work and I think that patternwelding could actually be easier . very good work , not sure If i should be congratulating someone for making fake patternweld but i think you have done a wonderfull job . Good grief! Kirk! This is stuning work! Its not even the same sword anymore. I remeber when you first got it. It handled so well. I cant imagine how it handles now with all the work done to it. Bravo! You are really an artist with these projects. I gave up on antiquing my Del Tin because I couldn't get off all of that *&^% lacqquer!! ARGH!! Finger nail polish remover works like magic removing the lacquer. ( Got that this from Nathan Robinson a while back ).